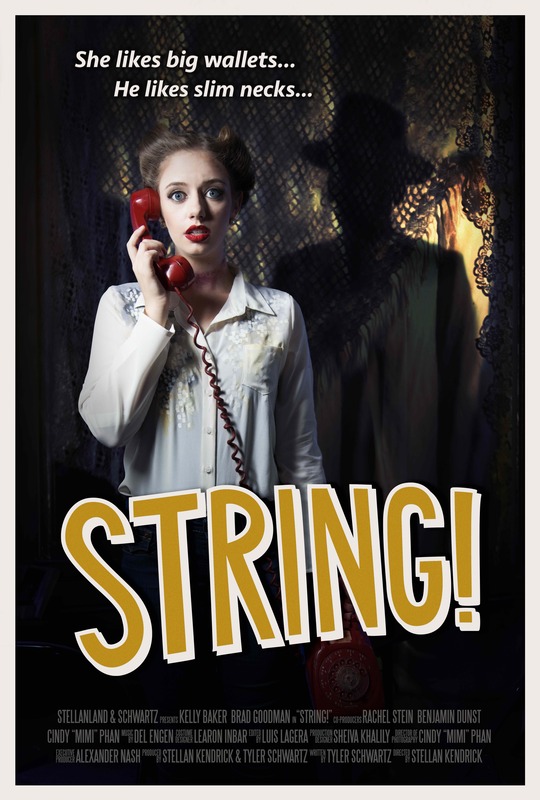 Firstly, I’d just like to say thank you to Writer, Tyler Schwartz and Director, Stellan Kendrick (Goodnight, Gracie) *see review* https://adamthemoviegod.com/goodnight-gracie-review/ for allowing me access to an online screener of their 10 minute Crime/Thriller short, “String!”. 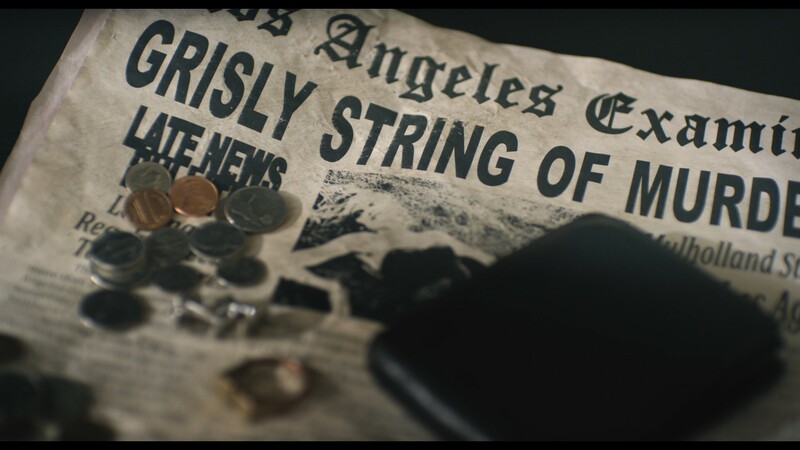 String is a short film inspired by classic radio dramas and film/noir of the 40’s and 50’s. Hollywood. A struggling young actress. 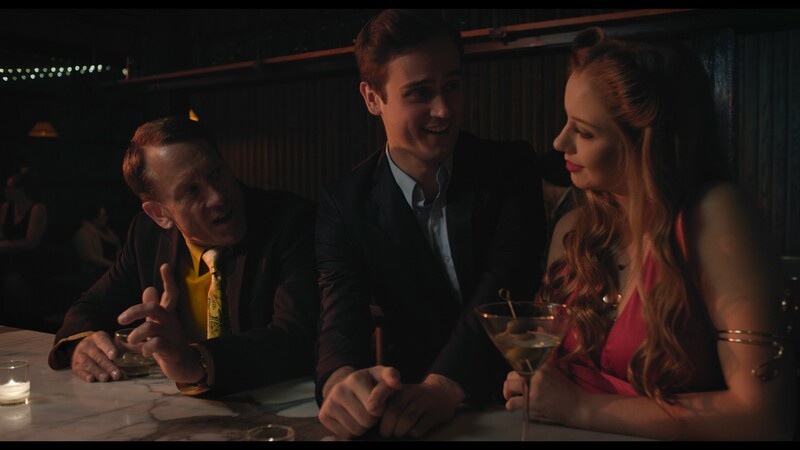 Isabelle Storseth (played by first timer, the lovely Kelly Baker) has turned to thievery to get by, fleecing men with her charm and beauty. She finds herself caught in a dangerous and potentially fatal game of life and death with her latest mark, Benjamin Carney (Brad Goodman) aka “The Mulholland Strangler”. The film also stars Stellan Kendrick, Chantalle Williams and Chen Chen Julian. (Excuse the poor resolution poster it was the only one I could find). There’s seriously nothing better than a modern dose of stylish film/noir, though it’s all too rare these days. 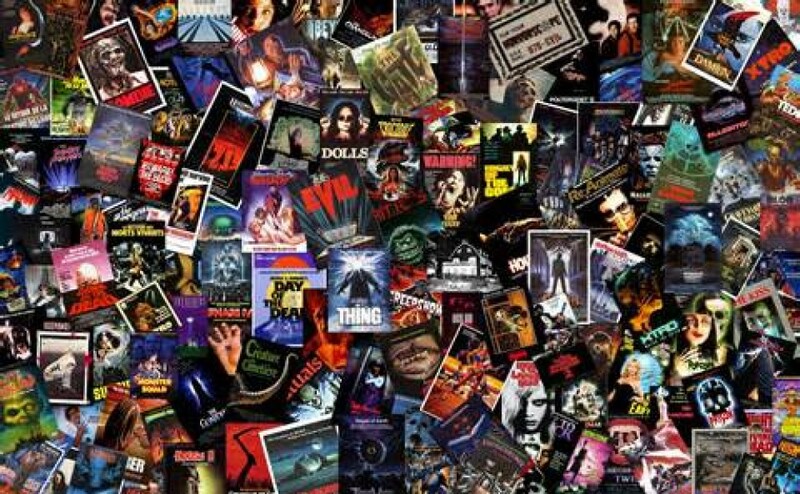 Once the most aesthetically appealing foundation for the crime genre, film noir has since fallen by the wayside in recent years, with Hollywood choosing to market busier looking features and main stream cinema. So it should come as no surprise that even a short film like String comes from a first time writer (whose probably a die-hard fan of the genre) and will most likely remain under valued. Interesting to see that DP, Mimi Cindy Phan made her film debut on String! as well. The promise of elegant cinematography has often been the main selling point of film noir and that’s quite the torch to bear for one whose new to the business. That said, Phan’s framing is lovely and there’s a series of really sharp close-ups. My favourite shot is in the beginning where she employs gentle zooming on a murder taking place inside a vintage car. The lighting and music are two other key facets of the genre, both of which I was incredibly pleased with here. There was some nice colorful back-lighting during the bar scenes and Del Engen’s wonderfully composed blues/jazz score oozes of Hitchcockian-like atmosphere. Engen adopts french horn, strings and flute all of which are prevalent in the genre. The performances are of a high standard and Goodman brings the heat. As a raw actress, not only does Baker’s beauty and character attire look the part of the femme fatale, she delivers an even performance to boot. Now I’ll admit, I don’t think it’s stated anywhere when String! is set (though if I recall correctly I think Isabelle uses a semi modern phone), but for a film of this nature I expected some of that corresponding noir dialogue and we never really got it. A couple of the effects were a little weak, namely the CG with the light bulb exploding and Goodman’s eye makeup toward the end of the film, which doesn’t quite look right. The script plays pretty straight though that’s usually to be expected, but Isabelle makes it a little too obvious that she’s hiding a weapon to use on Carney and I thought it was unlikely that she wouldn’t have checked the envelope before agreeing to the terms. Being a cinephile and someone that’s interested in the entire film making process, I’m a sucker for films like “String!”. Reminiscent of a number of film noir gems and Hitchcock’s work, crossed with something like “The Hillside Strangler”, String! is an aesthetically pleasing and entertaining short. I love the cinematography, the lighting is effective and Del Engen’s score is reason enough alone to give this one a look. Goodman gauges Benjamin’s seedy nature really well and I was really surprised with Kelly Baker, she’s gorgeous and delivers a nice consistent performance. There’s a couple of minor inconsistencies and one or two script specifics that I thought could have been handled differently but this is Schwartz’s first writing credit, so with that in mind, he’s done quite the job. String! is a blast and is a must-see for fans of film noir (I just wish there were more of us out there). I’ve seen two of Kendrick’s shorts now and been impressed with both so I can’t wait to see what he does next.